Chimney prepared for wet stack service, how? 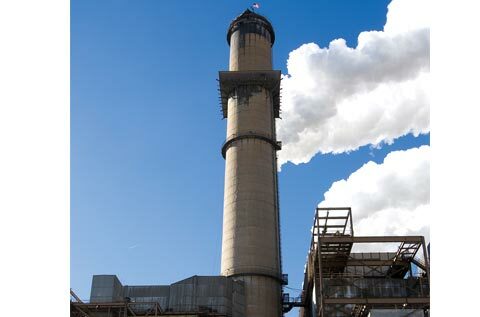 Coal fired power station in the western United States prepares its four chimneys for wet stack operation by installing PennguardTM linings in the brick flues. The San Juan Generating Station near the town of Farmington, New Mexico is a mine mouth power station with an installed capacity of 1,800 MW. Its four boilers, two of 350 MW and two of 550 MW each, fire coal with a sulfur content of 0.9%. The power station has operated FGD plants for many years and it will now move to desulfurizing one hundred percent of its exhaust gas flow. In the mid seventies, the San Juan Station was fitted with FGD plants using the Wellman Lord process. This early FGD system used four separate scrubber vessels per unit. In the late nineties, the FGD system was converted to a wet limestone process, upgrading the sulfur removal efficiency from 75% to 90%. The power station continued to bupass a portion of the gas stream around the FGD system. 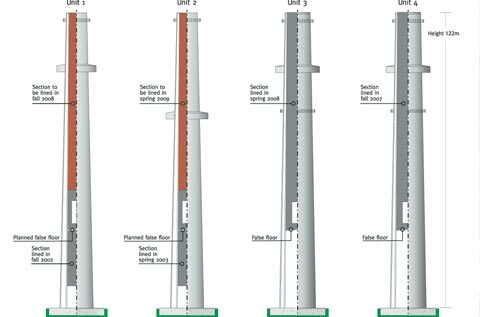 Through the years of operating the San Juan chimneys with a mixed, partially desulfurized gas flow, it was found that the free standing brick chimney flues were subject to degradation especially in the mixing zones for treated and non-treated gas flows. In 2002 and 2003 the station installed PennguardTM linings in the lower part of the brick flues of the Unit 1 and Unit 2 chimneys. In order to prepare the chimneys for low temperature wet stack operation, the owners also decided that the brick flues in all four chimneys would be protected by PennguardTM linings over their full height. In the most recent environmental upgrade at San Juan Power Station, the Unit 4 chimney with 2,545 m² of brick flue surface was the first one of four chimneys to be lined with the PennguardTM Block Lining System. The chimney contractor, Pullman Power, had to complete the lining of the brick flue and all related works in an outage of 6 weeks, during the third quarter of 2007. Before installing the PennguardTM lining, the brickwork was power washed and then grit blasted to remove all dirt, deposits and other loose particles. 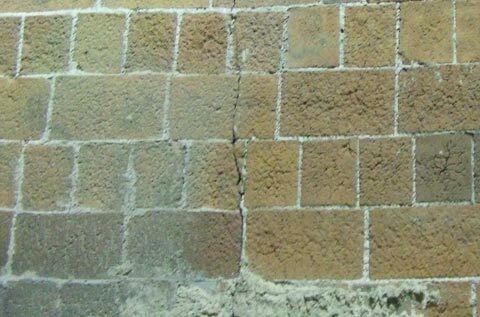 It is normal for brick flues to show some offsets between the individual bricks. 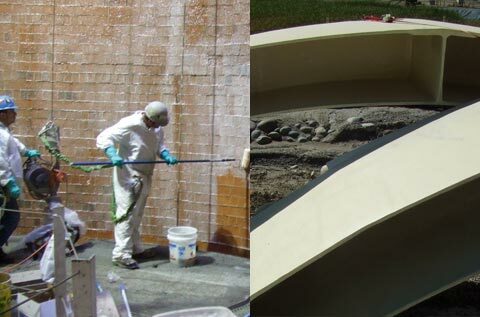 The PennguardTM lining can accommodate most of these surface irregularities by using a thicker adhesive back joint. 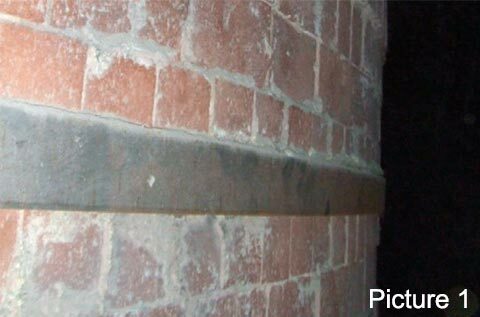 Narrow, stable cracks, caused by settling of the brickwork or thermal shocks, can usually be covered by the PennguardTM Block Lining System without ad­­­ditional preparation. After grit blasting and application of the Primer onto the brick surface, liquid collection gutters were installed into the chimney. 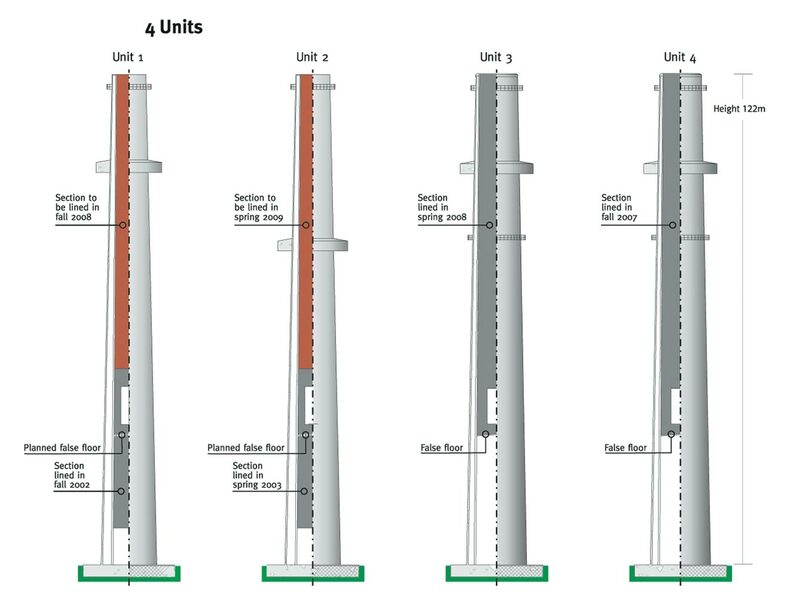 Alden Research Laboratory and Pullman Pwer designed a liquid collection systems for each of the four chimneys. 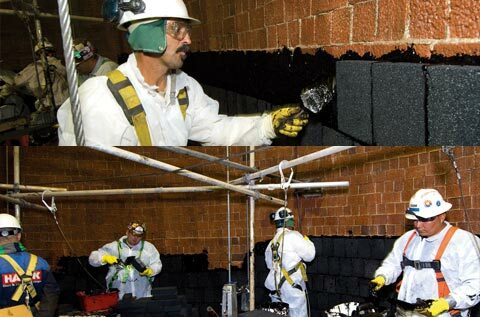 The PennguardTM Blocks are applied to the brick substrate using the PennguardTM Adhesive Membrane. The PennguardTM lining installation crew consisted of installers, who were supported by helpers on the platform as well as on ground level. The typical installation productivity is 1.5 to 2.0 m² per installer per hour. All the work, including surface preparation, installation of the liquid collection system, lining application and construction of a false floor was completed within the 6-week outage. 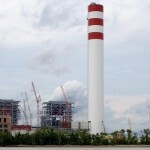 The similar Unit 3 chimney was the second chimney to be lined and was successfully completed as well, in a 6-week outage, during the first quarter of 2008. 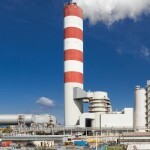 The applications in the Unit 1 and Unit 2 chimneys are scheduled in the third quarter of 2008 and the first quarter of 2009. 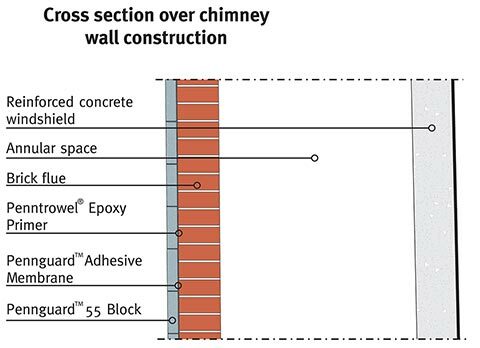 The combined surface area of all chimney flues to be lined is 8,125 m². Ever since the introduction of FGD plants, owners have decided to re-use their existing, brick lined chimneys for low temperature, acid condensing operation. 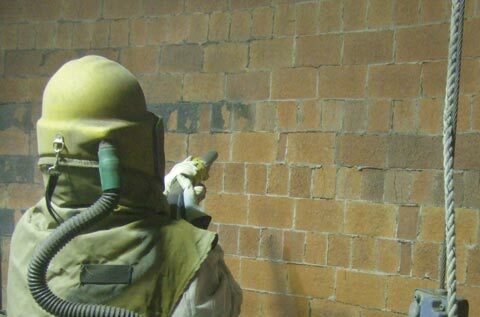 Brick flues have been prepared for agressive FGD operating conditions in various ways and PennguardTM linings have proven to be the most effective, durable technology. 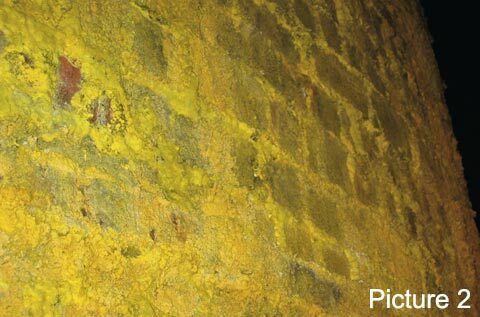 A lightweight, impermeable PennguardTM lining will form a positive barrier, isolating the brick flue from any contact with acidic flue gas and condensate. Picture 1 shows the outside of a brick flue that was internally lined with PennguardTM and then placed in wet stack service. Picture 2 shows the outside of a brick flue that was left unprotected except for pressurizing the annular space, and then placed in wet stack service. A PennguardTM lining is lightweight and fully bonded to the brick substrate by its adhesive. It does not require any anchors or supports that could lead condensate into the lining and create weak spots as a result of corrosion. 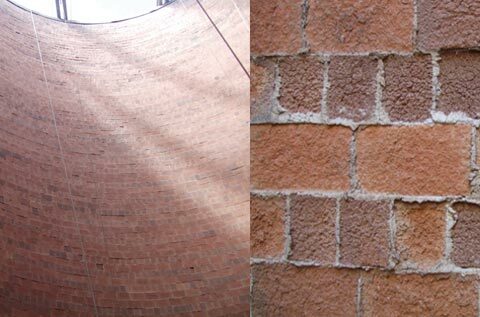 By their nature, most brick flues have irregularities such as bulges, offsets between bricks and narrow cracks. Thanks to the limited size of PennguardTM Blocks and the flexibility of its adhesive, a PennguardTM lining will readily adapt to most of these irregularities.